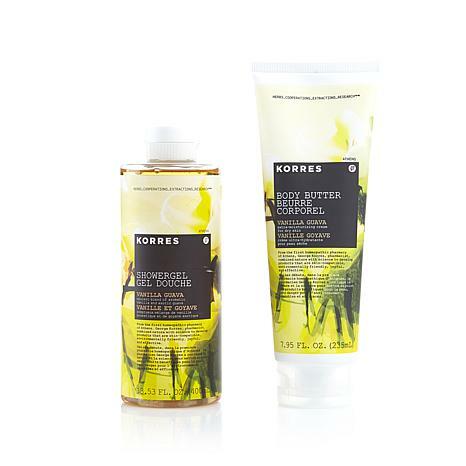 Indulge your senses with an opulent blend of aromatic vanilla and exotic guava. Sure, this dynamic duo cleanses and moisturizes your skin; yes, it helps temporarily reduce the visible signs of aging — but it's hard to focus on the beauty benefits when the scent is so divine. Ingredients: Water (Eau), Sodium Coceth Sulfate, Coco-Betaine, Decyl Glucoside, Glycerin, Phenoxyethanol, Sodium Methyl Cocoyl Taurate, Sodium Cocoyl Isethionate, Fragrance (Parfum), Maltooligosyl Glucoside, Benzyl Alcohol, Lactic Acid, Hydrogenated Starch Hydrolysate, Potassium Sorbate, Tetrasodium Glutamate Diacetate, Sodium Dehydroacetate, Guar Hydroxypropyltrimonium Chloride, Benzoic Acid, Hydrolyzed Oats, Althaea Officinalis Root Extract, Helichrysum Arenarium Flower Extract, Tocopherol, Dehydroacetic Acid. This is a reorder! I first received the violet body butter and shower gel in December. It smells just like spring violets - a very light floral. Love it! I can wear it to the office and not overwhelm anyone with fragrance. I just smell clean and pretty! My new favorite! 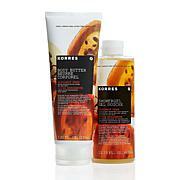 Korres shower gel and body butter hydrate the best of all others Ive used. The clean fresh white grape scent is my favorite. A little bit of gel gives a lot of lather so it lasts a long time. The body butter helps my skin look smoother and feel soft. I love it!